Pre-Order prices for AMD’s upcoming A10-7850K and A10-7700K Kaveri APUs have been revealed by ShopBLT (courtesy of CPUWorld). 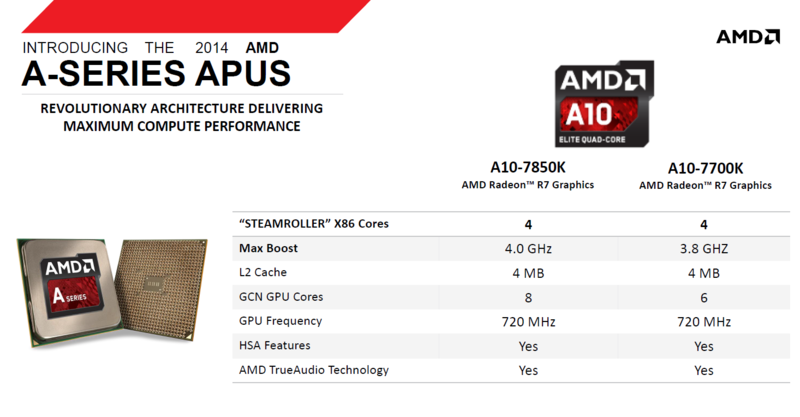 The AMD Kaveri APUs are based on the next generation x86 Steamroller architecture and GCN cores which will deliver a huge performance uplift over Richland in both graphics and compute. The AMD A10-7850K is the flagship Kaveri APU for 2014 which would replace the Richland A10-6800K APU. The A10-7850K has four Steamroller cores and 512 GCN stream processors which bring its performance on a level equivalent to the Radeon HD 7750 in terms of graphics performance. The A10-7850K has a max compute of 856 GFLops (GPU + CPU) compared to 779 GFlops on the Richland A10-6800K APU. The clock speed of the APU is maintained at 3.7 GHz which is presumably the base clock while Turbo clock would push the speeds beyond 4 GHz barrier. The GPU which is positioned in the R7 2**D series is clocked at 720 MHz while the APU itself has 4 MB of L2 cache. The GCN graphics die would feature 8 GPU cores which represent a total of 512 stream processors. The TDP for the A10-7850K would be set at 95W. AMD A10-7850K will support both Mantle API, DirectX 11.2 and OpenGL 4.3 and feature dual graphics functionality with the AMD’s Cape Verde based discrete GPUs. Next up, we have the A10-7700K which is another unlocked chip featuring the Steamroller core architecture with a max boost clock of 3.8 GHz and base clock of 3.5 GHz. It features 4 MB of L2 cache plus HSA features and True Audio technology support. The GPU side ships with a GCN graphics die featuring 6 shader units equaling to a total of 384 Stream processors clocked at 720 MHz. The A10-7700K features a TDP of 95W so we may see one Kaveri APU part based on the A8 series which would feature a TDP of 65W. The A10-7850K has been listed $189.24 US while the A10-7700K has been listed for $167.00. Such retails have listed upcoming products much earlier prior to their launch but the prices have always been on the high-side until the official launch of the products. The actual price range of these chips would be set below the $150 price point when they launch on 14th January 2014. In addition to Kaveri APUs, the site also listed new Richland APUs A4-6320 and A6-6420K. Both APUs have a dual Piledriver cores, 1 MB L2 cache, HD 8000 graphics and a TDP of 65W. The A6-6420K operates at a base clock of 4 GHz and boosts to 4.2 GHz and will retail at a price of $75.85 while the A4-6320 has a base clock of 3.9 GHz and retails for $57.30. Both APUs feature a TDP of 65W.